At last Apple came put with its new iPhone, Apple announced its newest iPhone in a press meet today morning i.e., September 10th 2014. This device is going to be launched later this year in Apple Online stores and retail stores everywhere. We can find many stunning features of this iPhone 6 and 6 Plus. 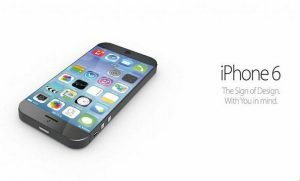 One thing we can expect with the advanced features of iPhone 6 the price is gonna be hike and of course that deserves the features included. iPhone 6 bump up to 4.7 inch and 6 Plus with 5.5 inch screen. The new retina HD display that suits the increased screen width, an ultra thin IPS display with 326ppi pixel density. You can find 64-bit processor, A8 Chip and M8 Motion Co-processor . Apple claims the battery life of 14 hours in iPhone 6 and 24 hours for iPhone 6 plus. Apple iPhone 6 and 6 Plus support 802.11 ac, the super fast Wi-Fi band. All new sensor support Focus Pixels and enables even faster autofocus. This series have auto image stabilisation, and camera can capture 1080 px video at 30 or 60 fps and slow motion video capture at 240 fps. We can find a new front facing camera with improved face detection capacity, pixel count yet to reveal. Pricing is not yet announced but we can expect a hike of $100 . On the whole we can expect the price of iPhone 6 unlocked version will be available at $649 ( Rs 39,600 approximately) and iPhone 6 Plus unlocked version will be available at $749 ( Rs 45,600 approximately). We can expect this iPhone 6 will be available from October 17 according to Apple website. Diwali Dhamaka we can say as it reaches the retail stores at the time of Diwali Season.